(Bloomberg) -- Bernie Sanders asked Rust Bell voters to embrace his most progressive ideas at a Pennsylvania town hall aired on the conservative Fox News Network as he tries to make inroads with the working-class voters who were drawn to President Donald Trump in 2016. 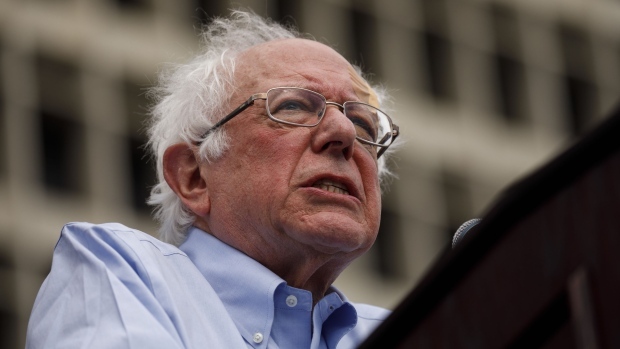 Asked whether his plans bring big price tags that would drive up the national debt, the Democratic presidential contender scoffed at the suggestion, saying his plans for more taxes on the wealthy and the biggest multinational corporations would cover the costs of his ideas. He said it’s Trump, who ushered through a massive tax-cut plan in 2017, who doesn’t care about soaring debt. The Fox News appearance followed a three-day campaign swing through Wisconsin, Michigan and Pennsylvania -- all states that Trump narrowly won in 2016 that will be crucial again in 2020. Sanders used the trip and the Monday night Fox forum to take on Trump, looking past competitive early-state primaries against 17 Democratic rivals and appealing directly to Trump’s core base of white working-class voters by presenting his version of economic populism. Sanders made clear that strong opposition to the 2017 $1.5 trillion tax cut -- which no Democrat in Congress supported -- will be at the center of his second bid for the presidency. He called a tax system that has let large corporations such as Amazon.com Inc. and Netflix Inc. pay little or no taxes “a disgrace.” He defended proposals for higher taxes geared toward the largest U.S. companies and a top individual tax rate of 52 percent. Asked about concerns that Democratic presidential contenders are tilting toward “socialism,” he defended the concept. “Democratic socialism to me is creating a government and an economy and a society that works for all rather than the top 1 percent,” he said. Sanders, who has a loyal base from his 2016 run in the Democratic presidential primaries, has trailed in polls only to former Vice President Joe Biden, who isn’t in the contest yet. He also has out-raised all the other declared Democratic contenders, taking in $18.2 million for his presidential bid in the first three months of the year. Sanders, 77, faces competition from a large Democratic primary field dominated by candidates who may have more appeal with the party’s rising base of young people, non-white voters and women. His unfavorable ratings are higher than most of his rivals, as many in the party still resent his attacks on Hillary Clinton in the 2016 primaries, contending they contributed to Trump’s victory in the general election. Some in the party have expressed concern that his far-left positions may lose the support of swing voters in a general election and lead to Trump’s re-election. But Sanders hasn’t backed away from any of his long-held positions, saying many of the ideas he’s proposed are no longer considered out of the mainstream. At the Monday town hall, he defended his proposed single-payer health system, “Medicare for All,” saying that while it would end private insurance coverage, patients still would have the ability to choose their own doctors and hospitals. The “overwhelming majority” of Americans would pay less for their health care because they wouldn’t be paying premiums or deductibles, he said. He also pushed for a hike in the U.S. minimum wage and $1 trillion in investment in infrastructure. And he continued to take on Trump in one area where the two men have generally agreed: the idea that free trade deals of recent decades have created wide job losses for American workers. He has called on Trump to reject his renegotiated NAFTA deal, arguing it‘s too weak to stop American jobs from going to Mexico after the president promised in 2016 to bring back lost manufacturing jobs. “You need a trade policy that works for working families and not just large corporations,” he said. Immediately before the town hall event, Sanders released a decade’s worth of his tax returns after years of resisting disclosure. The returns show Sanders and his wife, Jane, earned more than $1 million in total income in 2016 and 2017, wealth powered by book royalties that put the candidate in the company of the “millionaires” he often chides. “If anyone thinks I should apologize for writing a best-selling book, I’m sorry, I’m not going to do it,” he said. --With assistance from Sahil Kapur and Laura Davison.